I've spent most of my free time this month pruning the roses. It's not a trivial task, getting out there and getting shredded by thorns, and add in a recurring shoulder problem I've been dealing with and it's been slow going. 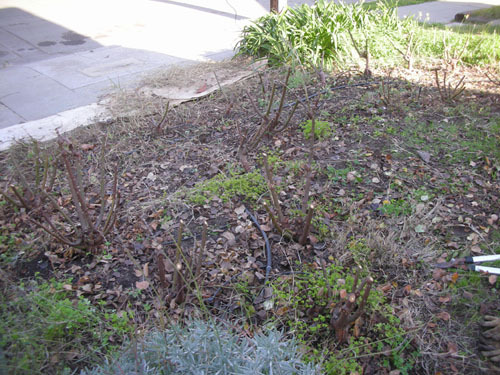 And pruning the roses is the best time to hand-pull Bermuda grass from inside the roses, so it's not just snip snip and then we're done. Today I finally finished the roses that need pruning right now (I have a couple roses that really don't need pruning). Yay! Of course, this photo tells me that the lavenders really need to be attacked and refreshed. I'm thinking of pulling them out and planting something else there, but can't decide what it would be. But now the roses are done for this season, and that was the big project. 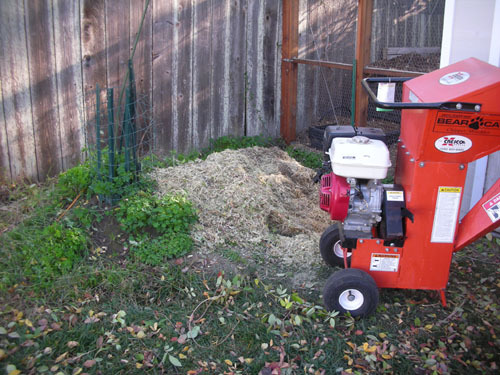 After seeing the epic brush piles I was making around the house (especially the one from the Cecile Brunner), Noel suggested we rent a chipper rather than try to force our sad electric one to try to handle all that. And since we had a truck on loan for a week from friends, we could make it happen without having the guys at the rental place laugh at us again (though they are always impressed by what we can get into the Geo). 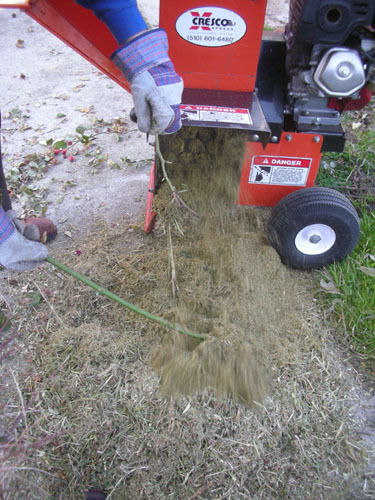 The gas chipper worked much better than our electric one (well, duh). If it weren't for the issue of where to store it and the incredible cost, I'd consider buying one. As it is, we can rent one as needed and not have to deal with all that. 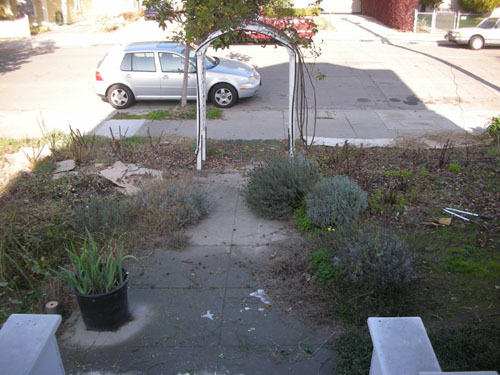 When we finished the front, we rolled it into the back and shredded the Cecile Brunner and wisteria trimmings. With all that shredding, the big guy went so fast that we still managed to return the shredder before 4pm to get a discount that made renting even more economical. 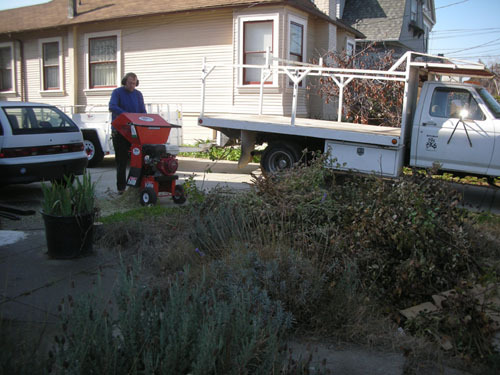 From the three brush piles we ended up with about two yards of shreds to use as mulch or add to the compost. Between the chipped brush and the many bins of leaves from our neighbor, this is going to be a good year for compost. 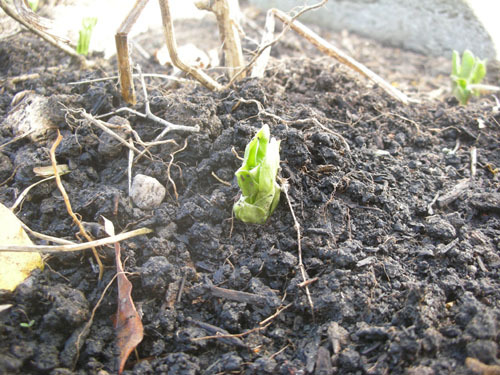 In the green manure front, the fava beans I planted as nitrogen fixers in the tomato bed from last year are coming up. They work best as a green manure if you let them get large then till them under before they produce pods. I may let one or two mature and harvest the beans from them (to use to plant more green manure, and also to eat). Our unseasonably warm weather continues even as the rest of the country is so cold that all molecular activity is slowing. And in keeping with that, the silly contorted quince is still blooming like mad. It's January, quince! Not March. 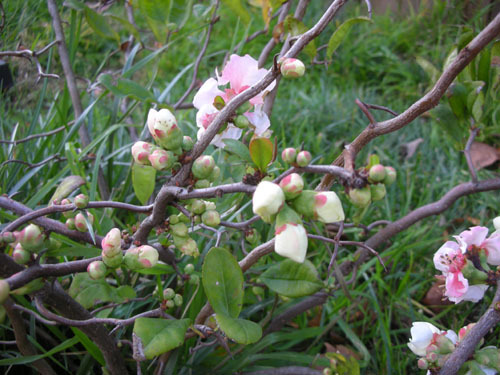 Only about a quarter of the plant is doing this, so we might still have quince flowers in March, too.